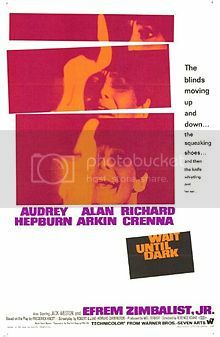 “The blinds moving up and down … the squeaking shoes … and then the knife whistling past her ear …” If today the suspense-thriller Wait Until Dark seems rather dated and stagy, perhaps it’s because the film was actually based on a 1966 Broadway play of the same name by Frederick Knott. Believe it or not, Alan Arkin (The In-Laws) steals the show as “Roat,” a psychotic killer out to steal a heroin-stuffed doll from “Susy Hendrix” (no relation to Jimi), a blind woman effectively portrayed by Audrey Hepburn. Sporting dark shades, a leather jacket and strange haircut, Arkin chews the scenery as he goes to elaborate lengths to try to get Suzy to give up the doll. Spoiler alert! The final sequence with Roat crawling toward Suzy with the knife is truly terrifying and reminded me of the attack on Cleopatra and Hercules during the storm at the end of Freaks (1932). Roat’s unlikely accomplices in crime include “Talman” (Richard Crenna) and “Carlino” (Jack Weston). Crenna does an adequate job and had a great film career but for some reason I will always remember him as pompous yacht club sailing champion “Al Pellet,” the guy who steals John Candy’s lobster in Summer Rental (1985). Wait Until Dark was directed by Terence Young, who also made the James Bond films Dr. No (1962), From Russia with Love (1963) and Thunderball (1965). Hepburn was nominated for an Academy Award for Best Actress but lost out to Katherine Hepburn (Guess Who’s Coming to Dinner). The cast also includes Samantha Jones, Julie Herrod and Efrem Zimbalist, Jr. (in another characteristically wooden performance). Henry Mancini composed the soundtrack. At movie theaters, a William Castle-type gimmick was used to turn down all the lights to coincide with the lights going out of the end of the film thereby leaving the audience in total darkness. Useless Trivia: Robby Benson made his film debut in Wait Until Dark as the “Boy Tossing Ball” in the airport scene. • In Danse Macabre (1981), Stephen King remarks, "The first fifteen or twenty minutes of [Wait Until Dark] are utterly terrifying, partially due to virtuoso performances turned in by Audrey Hepburn and Alan Arkin (and in my view, Arkin's performance as Harry Roat Jr., from Scarsdale may be the greatest evocation of screen villainy ever, rivalling and perhaps surpassing Peter Lorre's in M), partially due to the brilliant gimmick on which Frederick Knott's story turns."